Solar Orbiter will be the first spacecraft to provide close-up views of the Sun’s polar regions. The mission orbit will take the spacecraft on an ellipse around the Sun that will take it up to the Sun’s higher latitude. This will allow the solar features to be kept in view and tracked for several weeks. For more detailed information, please see the Solar Orbiter pages on the ESA website. The mission orbit is designed to be synchronous with the Sun’s rotation providing long duration observations for the first time. This will enable the mission to observe the build-up of events such as solar storms. The instruments on board will undertake remote sensing observations of solar features and in situ measurements of the solar wind bombarding the spacecraft. This combination of remote and in situ instruments will enable in depth studies of the close link between the origin of solar features such as solar eruptions and their emergence into space. This unique mission could provide major breakthroughs in our understanding of how the inner solar system works and is driven by the solar activity. 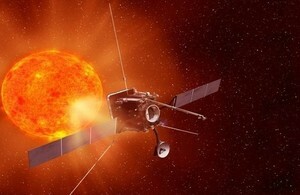 The three-axis stabilised design of the spacecraft is being developed to withstand the scorching heat from the Sun that will hit one side and the cold of space on the opposite side which will usually be in shadow.. The solar arrays are being engineered to provide the critical power supply without overheating. Solar Orbiter is managed and financed mainly by ESA with strong international collaboration with NASA as part of the International Living with a Star initiative. The Solar Orbiter spacecraft is based on the BepiColombo design reusing the technology developed for this previous mission . Additional heat protection will be added to enable it to operate in extreme thermal environments. The instruments will be provided with cut-outs and doors in the heat shield. The instruments were selected jointly by ESA and NASA as part of the collaboration to provide the in situ and remote observations. UK teams from University College London, Imperial College London and Rutherford Appleton Laboratory are involved in 4 out of the 10 instruments. The UK Space Agency is funding the UK involvement. SWA (Solar Wind Analyser) uses three sensors and a processing unit to measure the different elements of the solar wind and characterise their behaviour under different solar conditions. As Principle Investigators MSSL of the University of College London led the development of this instrument suite and built one of the sensors. MAG (Magnetometer) comprises two sensors located on a deployable boom in the shadow of the spacecraft, i.e. away from the Sun and an electronics box within the spacecraft body, enabling in situ sampling of the magnetic field and providing important diagnostic information. Imperial College London have led the development of this instrument. EUI (Extreme Ultraviolet Imager) is a suite of imaging telescopes that will provide images of the hot and cold layers of the solar atmosphere and of the solar corona showing the dynamics in fine detail and providing the link between the solar surface and outer corona. MSSL of the University College London is a Co-Investigator for this instrument. SPICE (Spectral Imaging of the Coronal Environment) is a telescope with a grating spectrograph and two active pixel sensor detectors that will provide images of the solar disk and corona. SPICE will be able to study features both on the surface and out in the corona and to look at the connection between them. Rutherford Appleton Laboratory is Principal Investigator for this instrument. UK industry has played a key role in mission development. Airbus Defence and Space, based in Stevenage, was selected by the European Space Agency as the prime contractor for the mission and built the majority of the spacecraft. The contract carries a value of about €300 million, one of the largest ever signed between the ESA Science Programme and a UK company.